Kaiser health news recently came out with two documents providing clarification on Accountable Care Organizations or ACO’s that were included in the Affordable Care Act (ACA). The mainstream media rarely discussed this. It comprised only seven pages of the health care law and dwelt with Medicare to which few critics paid serious attention. For providers of health care, this offers a major change in the way Medicare operates. It delivers care at lower cost while maintaining quality. The ACO model can also apply to all patients, not just Medicare. Savings while maintaining quality care can run into the hundreds of billions of dollars. 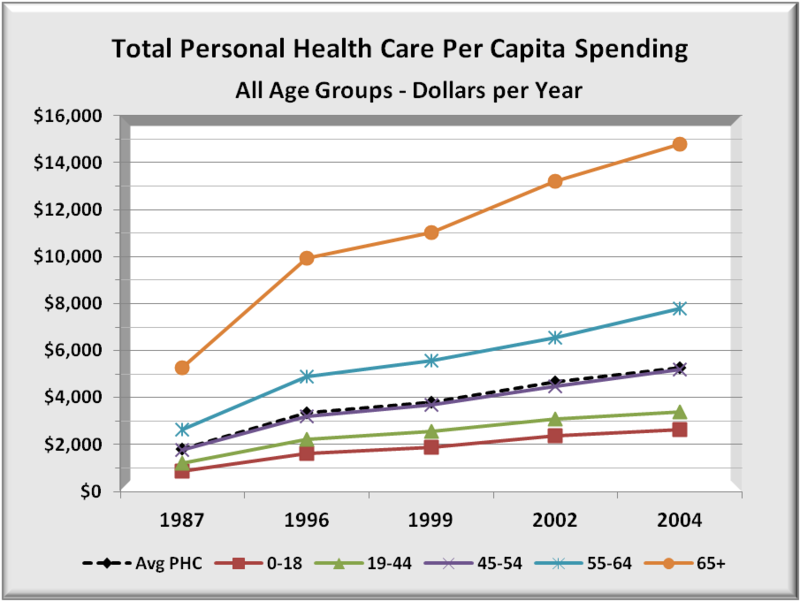 Health care spending is highly skewed. For 9 out of 10, your health care is fine. If you are the 1 in 10, you could be bankrupted without adequate health insurance. Averages don’t tell the story, a bit like the infamous words of Clint Eastwood, “Do you feel lucky?” If you had to pick from two guns, one with all empty chambers and the other chambered with a single round, your odds would be lower of selecting a gun with a loaded chamber than of being bankrupted or nearly so if you had inadequate health insurance. The average is very low, but would you gamble those odds with your family’s health? But it also explains why so many people do not understand there is any health problem. Being so highly skewed, most people have never encountered a serious illness or accident, and some of them wonder what all the fuss over reform is about. Rationing is not getting needed care. Waste is getting care not needed and causes rationing for those in need. One way to determine if there is waste is to compare large samples of people in areas of highest cost to those in lowest cost. While some variation will exist because of cost of living factors, larger variations can only be explained by greater use of care in higher areas versus lower areas. The method used compares selected components of health care. Each category compares the highest 20% of population with the lowest 20%. For national data, rankings mean there are two groups of nearly 60 million. For Medicare and Medicaid, it is over 8 million each. Age differences among these populations were minimal, though higher cost areas tended to be more urban than the lower cost population. Differences between the highest and lowest were minor in some cases. But in a number of categories, differences were huge. Either millions in the United States are being under-served, or millions are being over-served wasting billions. For the population as a whole, total health costs in the highest states were nearly 40% higher than the lowest cost states. In hospitals, the spread was slightly over 40%, while physicians were less than 30%. 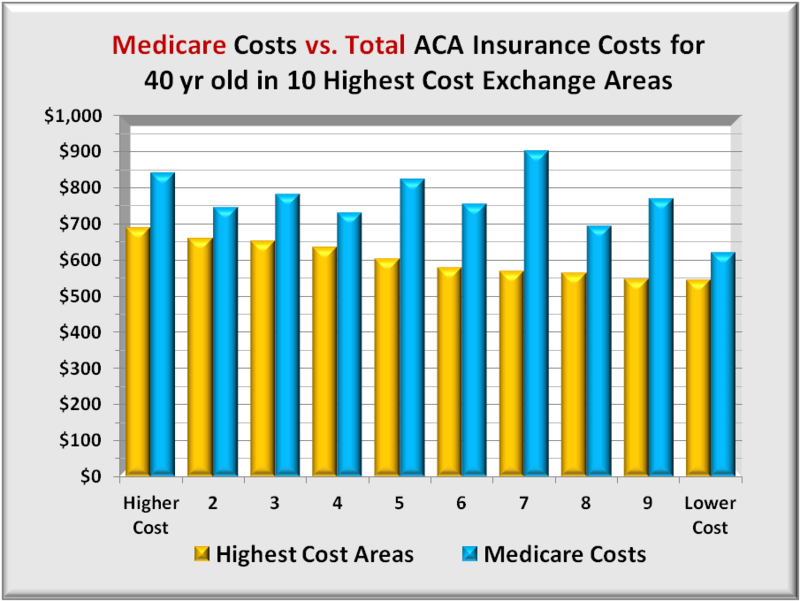 Highest spreads were nursing home costs that were nearly three times higher. In Medicare, hospital costs are 30% higher, but physician costs are some 70% higher for similar populations. 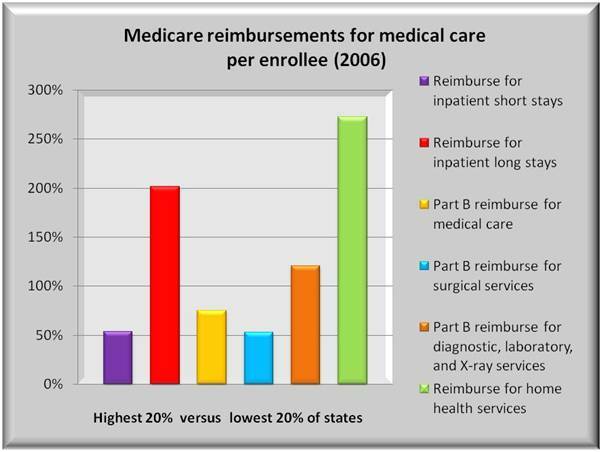 With all paying equally into Medicare, rationing already exists. 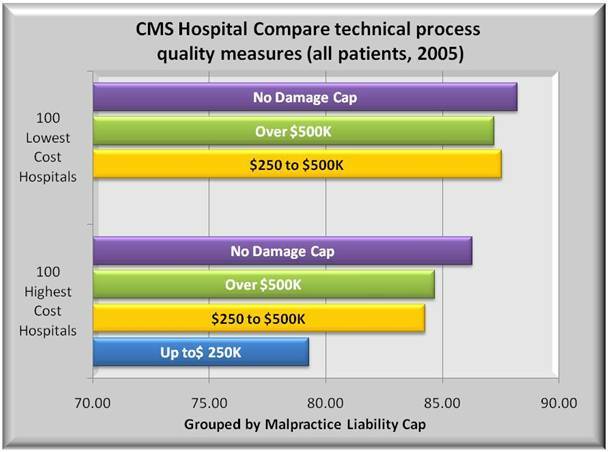 Despite these higher costs, a number of quality measures suggest that quality is actually better for lower cost states. In 2006, the U.S. spent over 1.7 trillion dollars on health care. 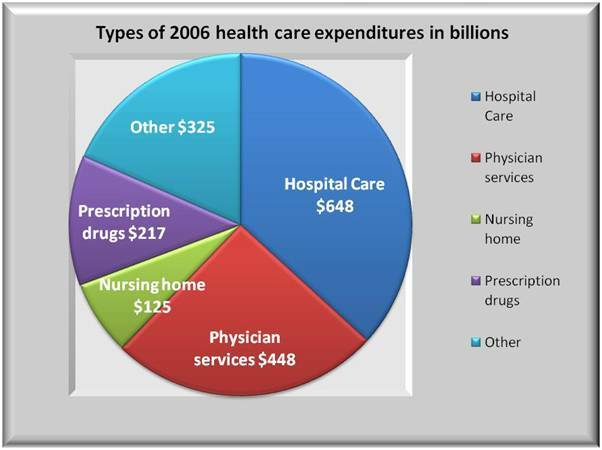 The graph below shows the analysis of expenditures: 37% went to hospitals, 25% to physicians, 7% to nursing homes, 12% to drugs, and 18% to other. Not only are costs high but they are rising faster than the economy consuming ever more funds that might otherwise go for jobs, education and infrastructure. The country is also jeopardizing its world competitiveness because other countries are able to offer quality health care at less cost. 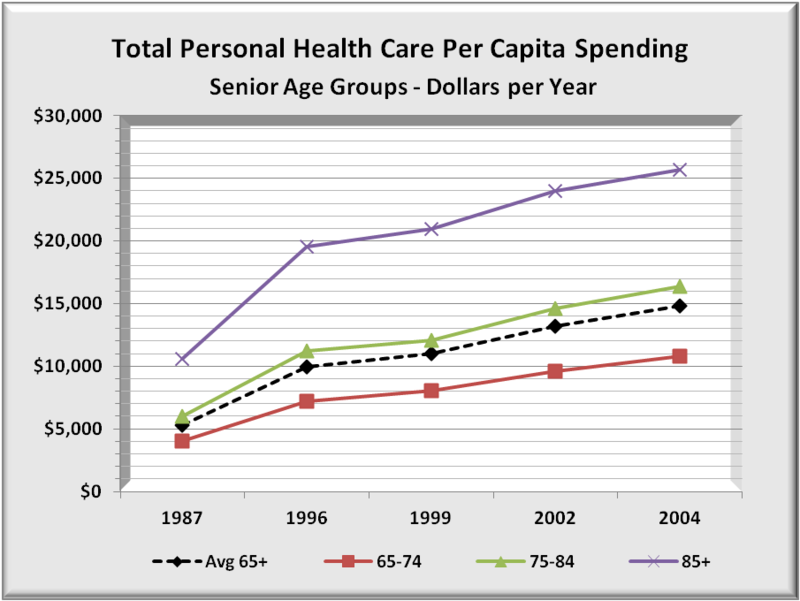 The aging of the population is a compounding factor when it comes to Medicare spending. 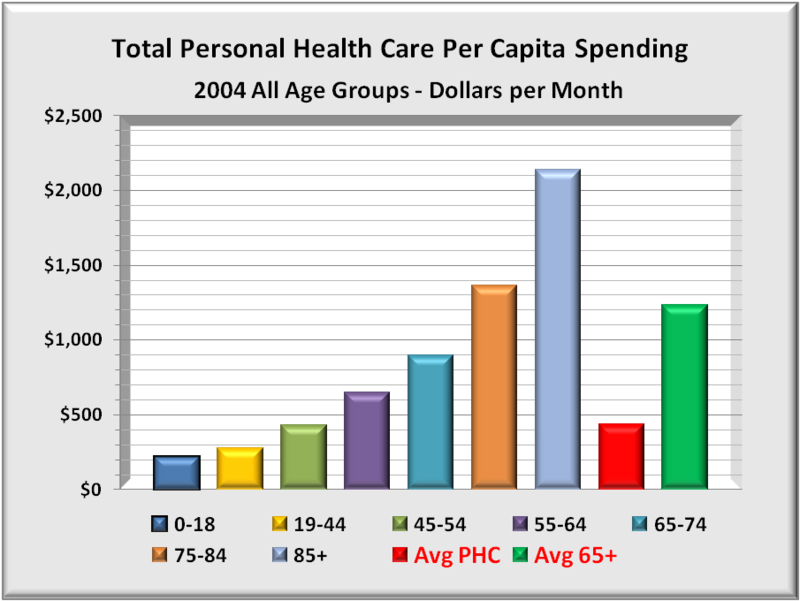 Here the government plays a greater role at a time when seniors’ health puts greater demands on any healthcare system. It will be almost 2050 before the baby boomer bubble works its way through and medical costs for seniors stabilize as a % of total spend. Source: Center for Disease Control – Health, United States 2008 Figure 19. Rather than compare absolute costs, this report focuses on relative costs, high versus low, and for very large samples. 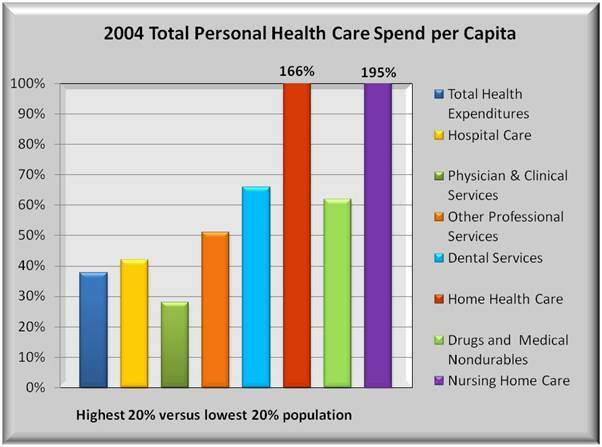 The graph below compares 8 categories comprising over 96% of total health care expenditures. The states included in each group may be different depending on the category. 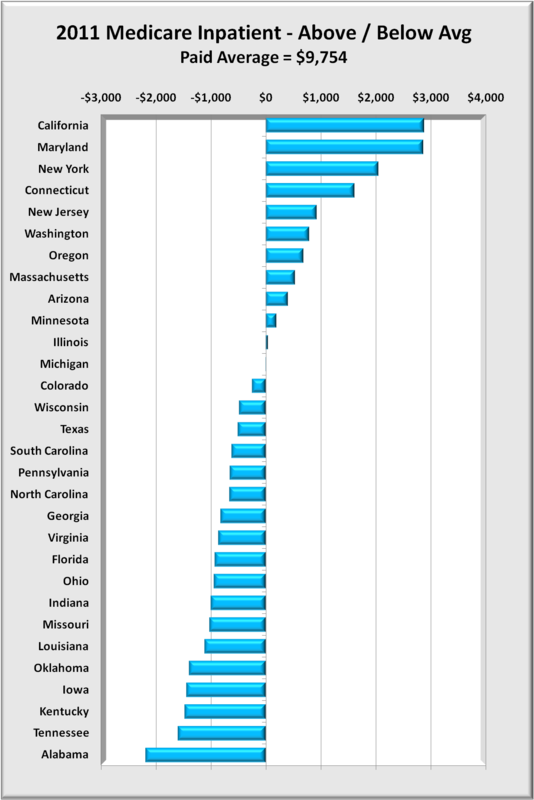 Total health care spend in the highest states was 38% more than the lowest states. 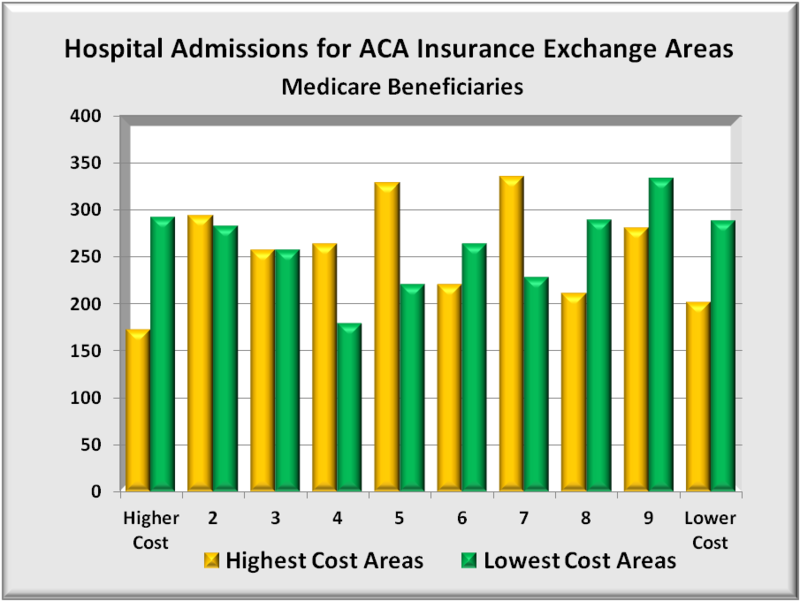 The highest hospitals that comprise 37% of total spend, were 42% above the lowest. Physicians accounting for 25% of spend were 28% higher. Home health and Nursing home care showed the largest differences, approaching 200% or nearly three times higher than for the lowest cost states. These lowest cost areas may be providing less care than what is considered “enough” and /or have found family sources that help out internally without outside help. The graph below shows that while government plays an increasing role in the over 65 group, there is still a major portion of costs being paid for by the private sector. And, after years of steady increase, total costs are accelerating due to the influx of baby boomers into this age group. Comparing year to year national averages is too broad to draw actionable conclusions. Comparing a single city to another may be too narrow. Fortunately, the government has in its favor a wealth of statistics for their programs. When comparing selected health components for very large populations, costs can only be explained by differences in volume of care. Other government statistics show little difference in outcomes despite wide differences in service. 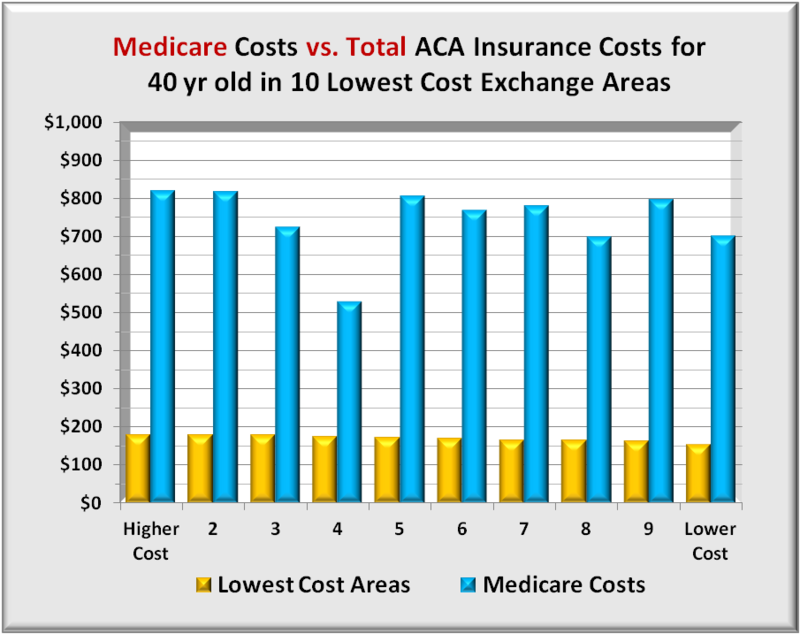 Medicare is the biggest government program, and below are some comparisons of interest. 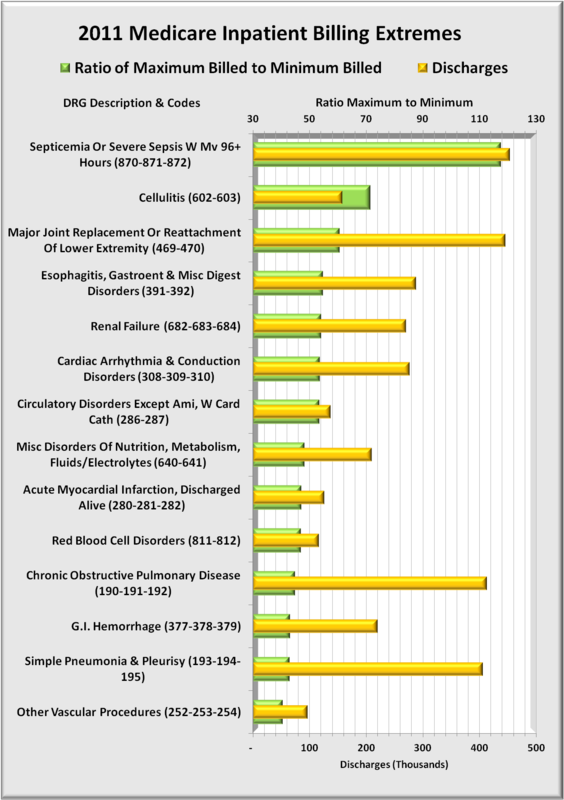 Source: Center for Disease Control – Health, United States 2008 Table 141. 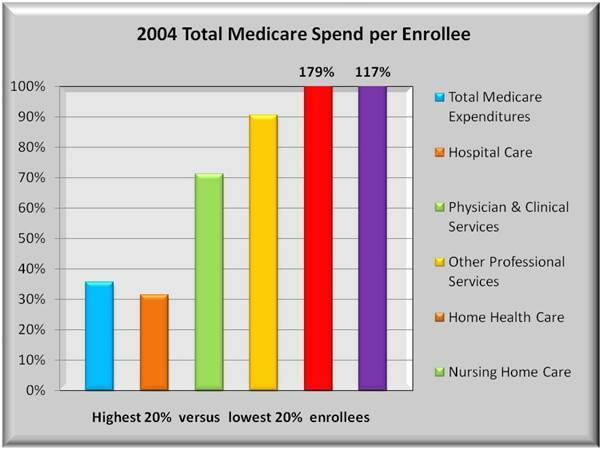 The graph below compares 6 categories comprising over 96% of Medicare expenditures. The drug program Part D did not start in time to be reflected in these 2004 data. The sample is large with 8 million in each group. States in each group may be different depending on the category. When compared to the total population, Medicare‘s spread between physician and other professional service costs is far greater while hospital differences are less. Home health care and nursing home care show similar large differences though the amount spent in these two areas is limited to 10-11% of all costs. Medicare imposes more restraints in these extended care areas. That may explain how, with nearly all nursing home residents being seniors, Medicare home and nursing costs are a relatively low proportion of the total. 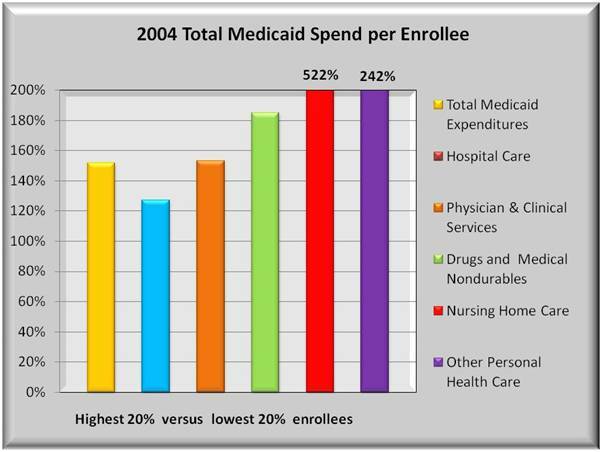 The graph below compares 6 categories comprising 92% of Medicaid expenditures. 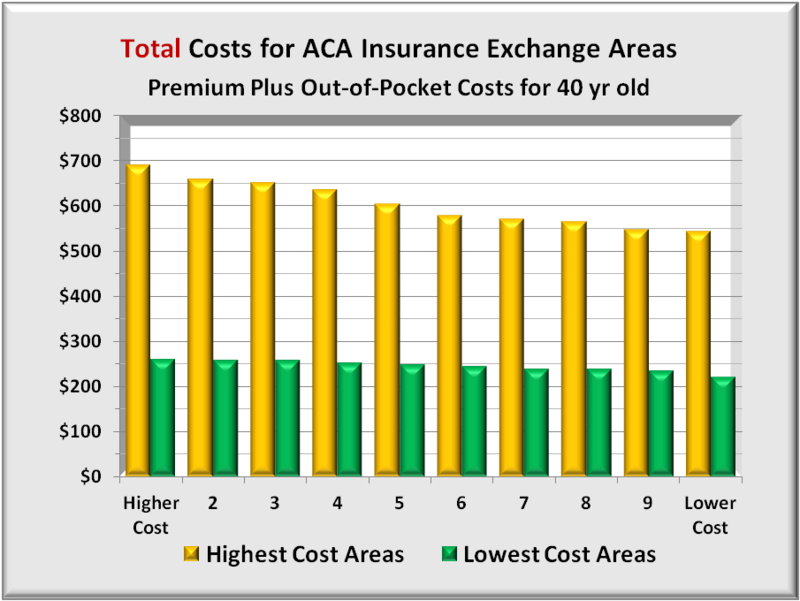 Here there are differences not only in cost (highest cost more than double the lowest) but in the mix. For Medicaid, hospitals and doctors do not play as large a role. Instead, costs tend more to drugs, nursing home care and other personal care. This group covers poorer people of all age groups so their needs are more like the broader population in terms of mix with one exception. 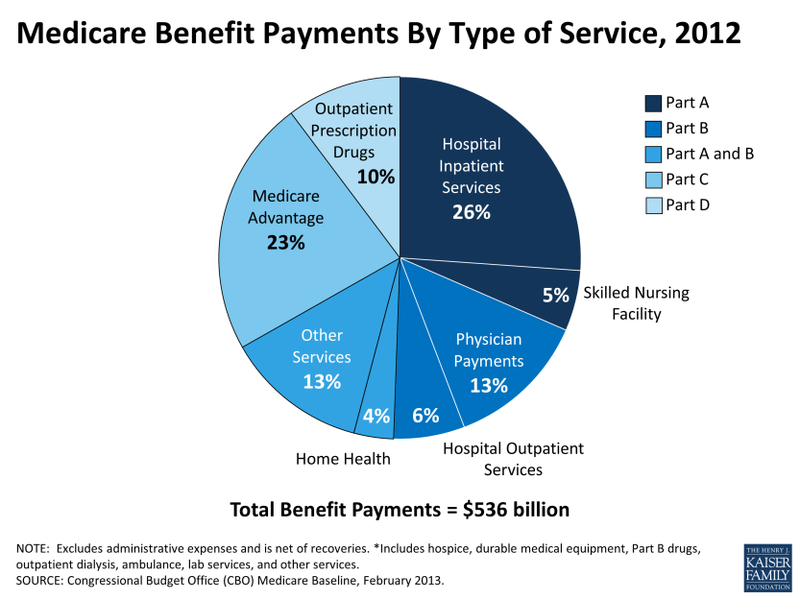 Medicaid offers nursing home help with those costs being 19% of total spend. There is another key difference from Medicare and that is the states contribute significantly to Medicaid, and states cut back some if funds are not available. 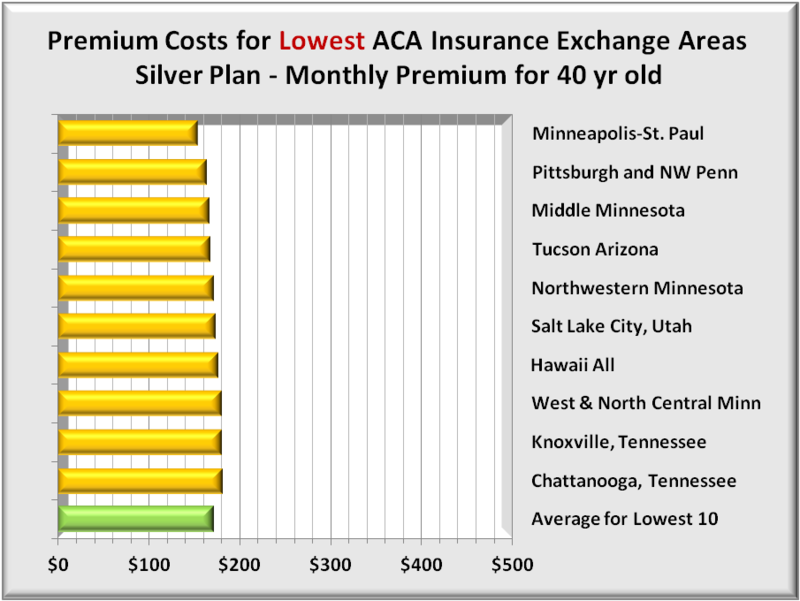 This plays a role in the greater difference between the highest and lowest cost states for all categories. 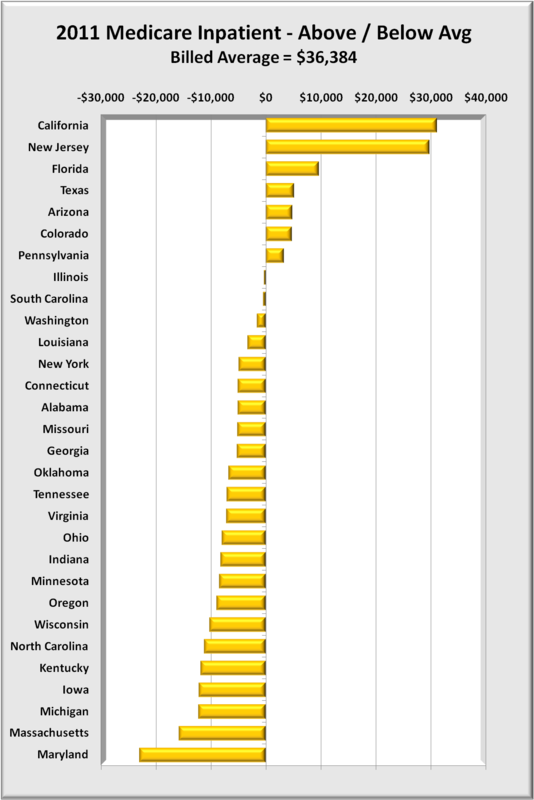 One can fairly assume that the lowest cost states get fewer services. 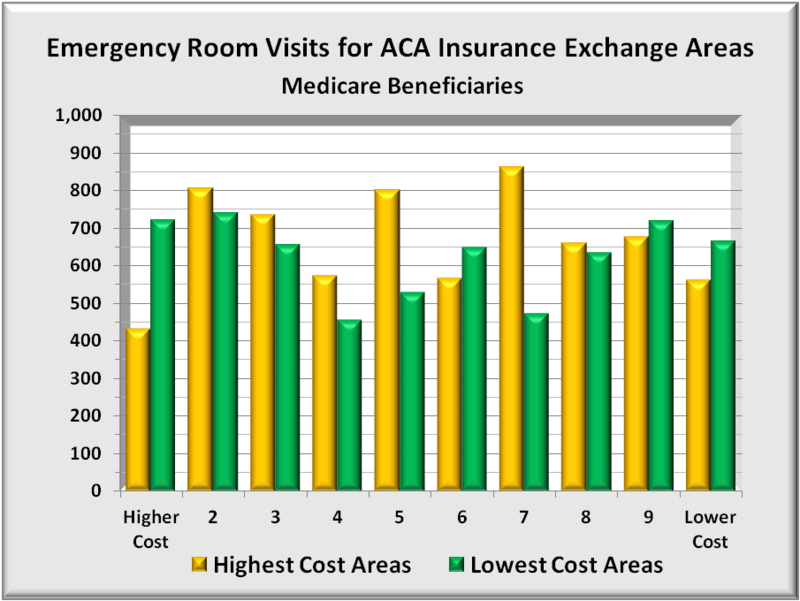 Tracking discharges also tracks admissions and the graph below shows 45% more total discharges in the highest cost states. 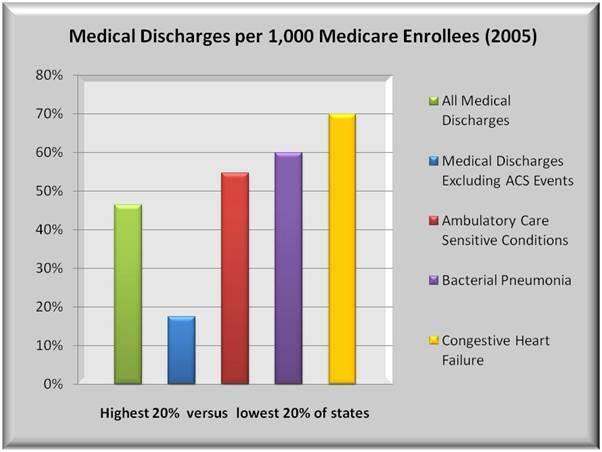 Non ambulatory care sensitive (ACS) events have roughly comparable rates of discharge. On the other hand, ACS discharges are more than 50% higher than the lowest cost states. 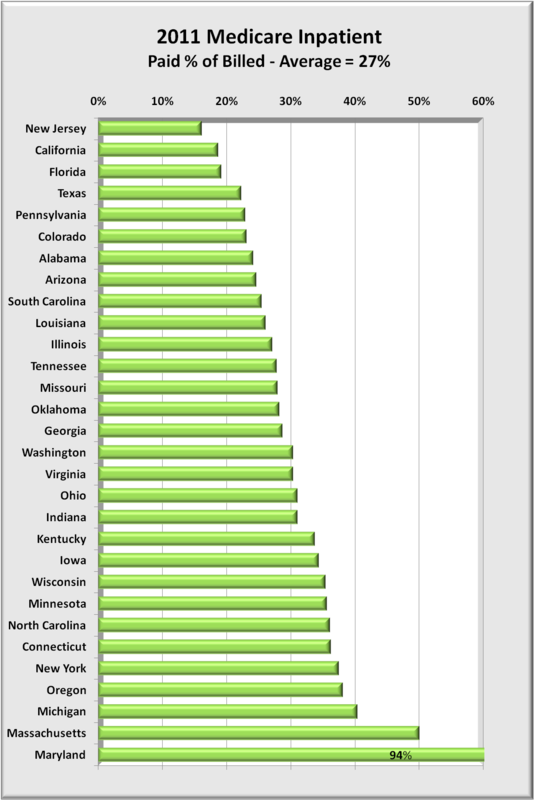 The number of beds does not appear to be a factor as many lower cost states actually have more beds per capita. Data is not available as to acute beds, though in any case, it is a doctor admitting a patient. While higher cost states may have more doctors per capita, that difference is nowhere as high as the difference in admissions. One can conclude that there are major differences in how often doctors admit similar patients, especially when you consider some 16 million people in two sample groups. Of course, for every admission, there is a cost. Using a still finer “filter”, the graph below shows wide differences depending on what services are performed. Inpatient short stays are 50% higher. But long stays are 200% or 3 times those of the lowest states. Diagnostic, laboratory and X-ray services are more than double the costs in the lowest states. Either the first group is getting excess care, or the second group’s care is being rationed. 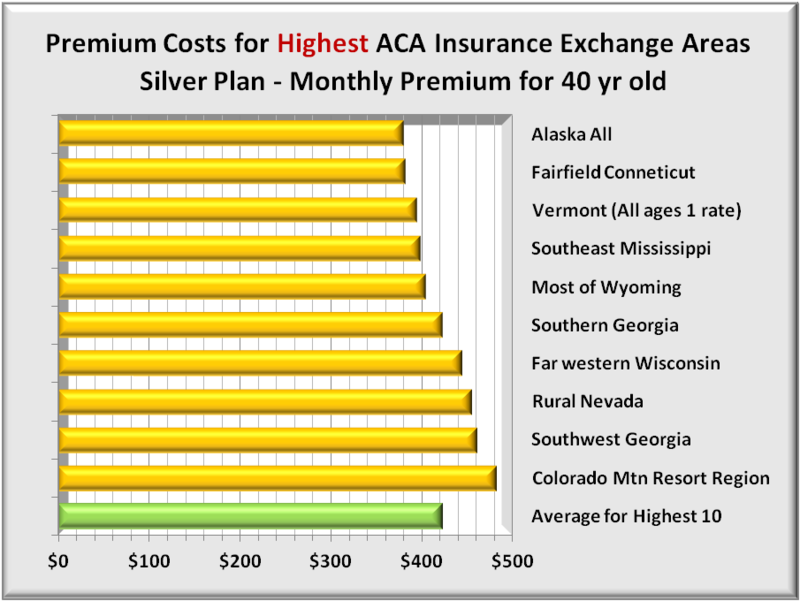 The biggest difference was in home health and for once, higher may be better as it compare the highest cost states to the lowest cost states. Home health is a more efficient use of funds than hospitalization or intermediate care facilities, so more may be better. Or it can simply be more take advantage of the service because it is available. Aside from complaints that insurers make medical decisions there would be no decision to make without a request. 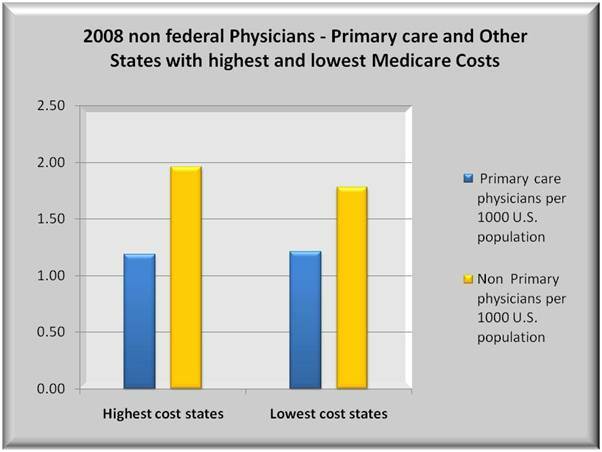 In the graph below, the number of primary physicians is about the same with a slight tilt toward lowest cost states. There is a measurable difference in the number of other physicians, including specialists. As shown, primary care physicians are outnumbered by specialists. And with admissions greater for the high cost group, it is logical to assign a greater share of hospitalizations to specialists. Some people, especially those who are well insured claim that greater hospitalization and its attendant costs are worth it. 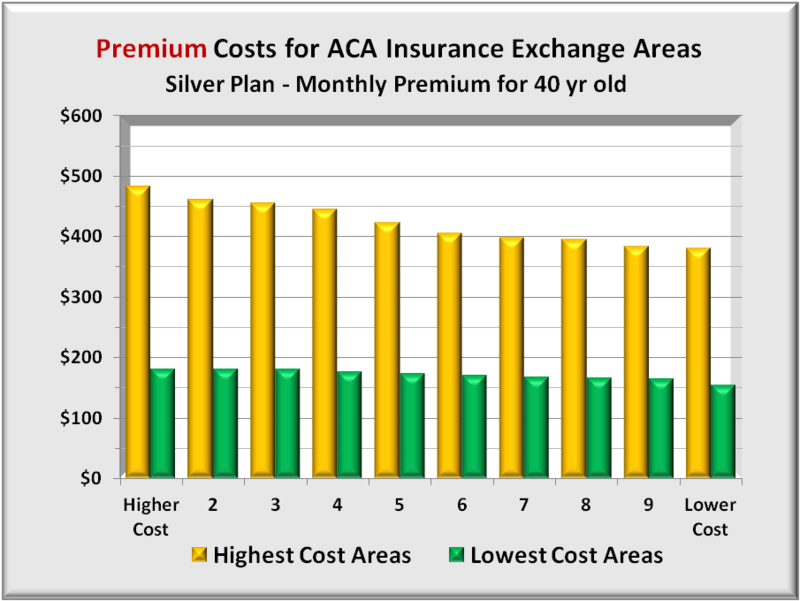 Leaving cost considerations aside, one might expect with all this extra care to have a lower mortality rate. Alas, this is not the case. More services do not necessarily yield better quality outcomes. The basis for high and low states is Medicare’s mortality tables. The data adjust mortality by age so a state with a greater proportion of very old people is not penalized. 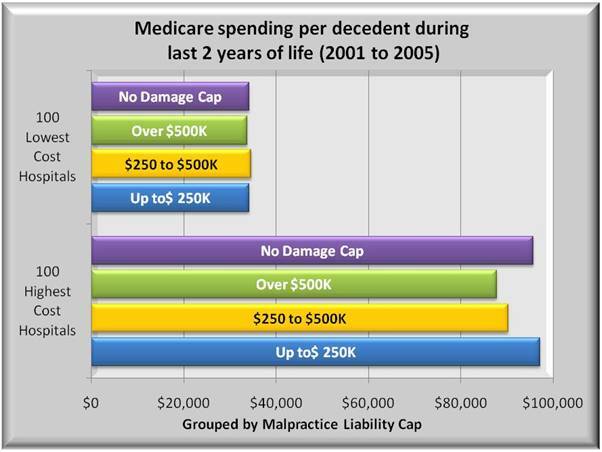 As the graph below shows, mortality is consistently higher in more expensive areas. 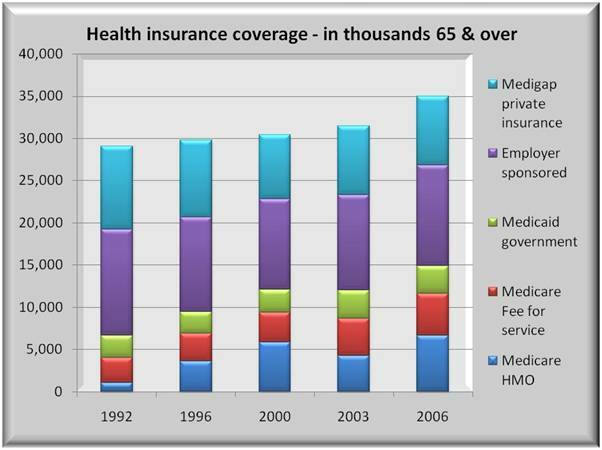 What is even more interesting is that those without HMO coverage have a higher mortality rate than the total average. 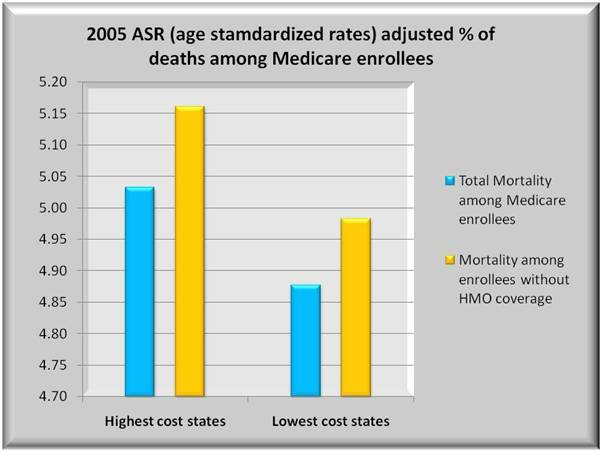 For that to occur, mortality rates for seniors with HMO coverage must be lower than for those without HMO coverage. 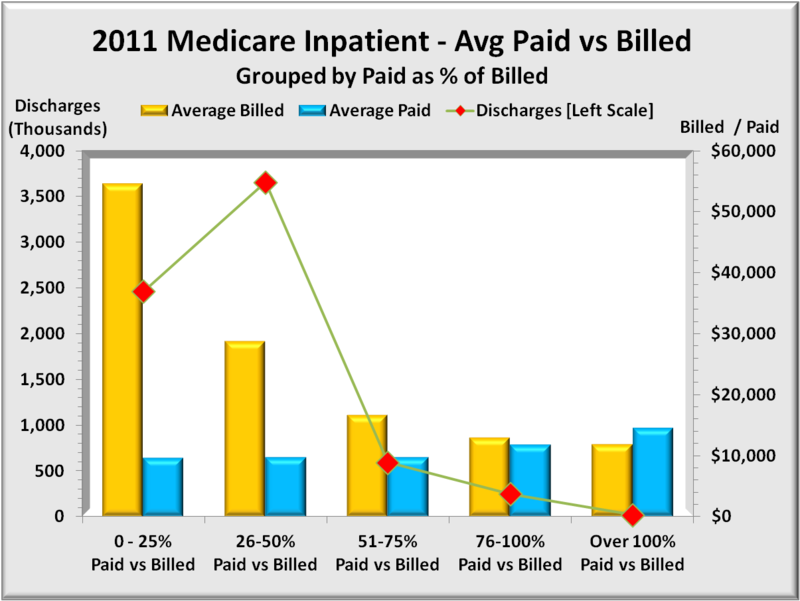 For all the cynics who think HMO’s are “too restrictive”, the results for Medicare folks at least, speak otherwise. And one factor is working in HMO’s favor. They have a greater tendency to work in teams, and statistics show that better managed providers do work in teams, with perhaps the most familiar name being the Mayo Clinic. So, did higher mortality result in lower costs? If a person dies, medical care stops. 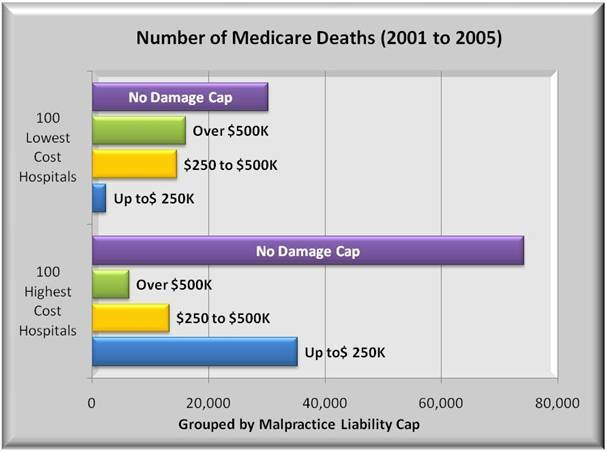 The graph below compares cost averages in which the patient died. It tracks costs of that final stay and also costs in the last six months leading to it. 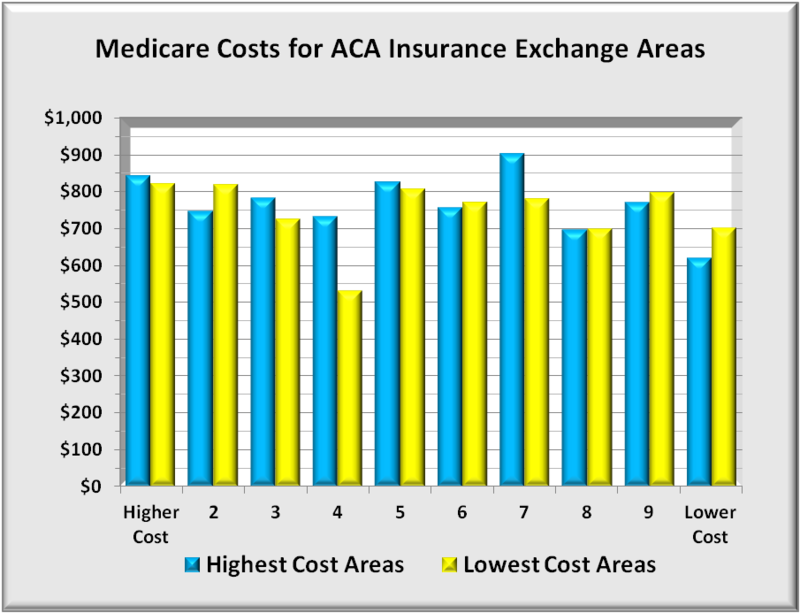 For the highest states, all 7 categories shown costs are more than double those of the lowest states. Remember, this is a sample of 8 million people in each group, from states north and south, east and west. The data show that seniors in high cost states are incurring nearly five times the cost of being in intensive care or coronary care units. 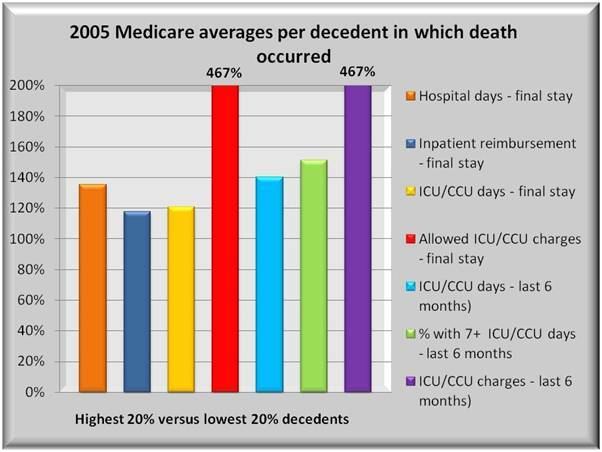 This applies not only to the final hospitalization but to repeat admissions to ICU/CCU in the six months preceding death. And despite all that extra cost and effort in the last six months, it does not appear to lead to better quality or lower mortality. In the previous graphs, there are numerous examples of huge differences between high and low-cost states without a comparable difference in outcomes. That observation alone suggests that cost cutting will not necessarily reduce benefits. While the majority of spend occurs in hospitals, it is the physicians who make the treatment decisions. 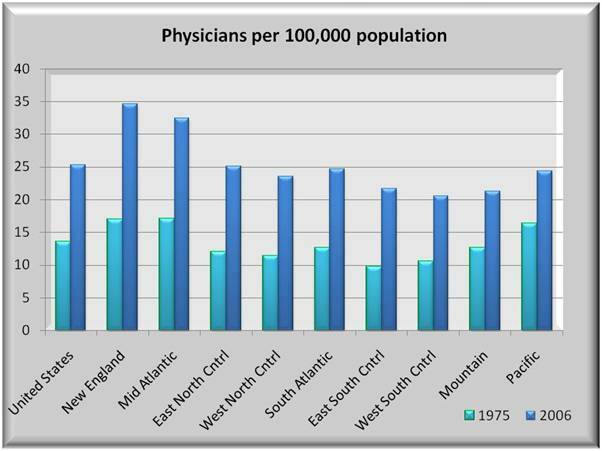 The graph below shows the total number of physicians per population by region. Though not homogeneous, the New England and Mid Atlantic states tend to include the highest states using different criteria shown in the above graphs. And these areas clearly have significantly higher physician ratios than other areas. True, there is much research occurring here, but only a portion of the difference would be due to those efforts. In summary, there are numerous areas when cuts could safely occur without losing quality.